Horse Training | I like to start with a 2-year old horse! I use a round pen, 50 'in diameter without protrusions or in any way that the horse can be caught up. First I use a halter with a 25-inch lead line attached to the halter, and I use a 7/8 "diameter rope with a hasp braided on one end. The halter is placed on the horse and the line is laid out on the ground on the left side of the horse. Approach about 3 'and call the horse's name - if the horse does not react, moisten the rope (use a cotton rope) and leave the horse alone for about 2 hours. Then return and call the name of the horse again, do not react, wet the rope again and let it stand for another 2 hours! Go to an area where the horse can not see you, but you can see the horse. Try to go to the horse at least 3 times during the day. Feed the horse and let him be aware that the trough is always in the same area, do the same with the water trough. During the training I initially only feed hay and water! To make it even better, you have to be the one who feeds the horse and takes care of him. At the end of the day brush it down and clean its feet before you put it in the barn. Talk to him every time you see him, just as you would talk to a person. After about 7 days and sometimes less, when you call the name of the horse, he will come to you. At this point you can remove the long line and go to a shorter line for training purposes. The 25 'lead line will from now on only be used for failure. To eject the horse, place it in the round pen in the direction of movement with the 25 'line of the halter. I use a white staff that is about 6 cm long, I like the white because it is the color that they see best. To get his attention, I raise the staff and make a tight circular motion while holding the line with the other hand. This ensures that the horse begins to move, keep it moving until it has made at least 5 trips around the round pen. then move it in the opposite direction and let it move around the round pin for 5 turns in the opposite direction. 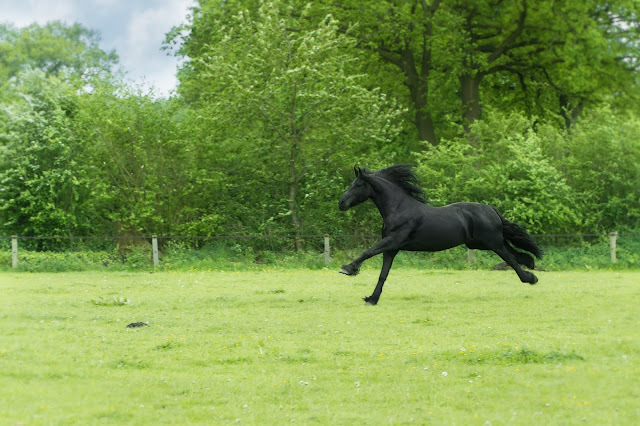 Look at the hips of the horse at all times for each type of up and down movement (bucking). When this is finished, we will go to the saddle! First take the saddle and place it on the floor in the middle of the round pin and let it "check". Of course you will have him under halter right now! Let him smell it and see it well. Then take the saddle pad and on the left side of the horse and let it slide gently over its back! Do not forget to praise and rub him while you set up the path. Then take the saddle and let it relax on its back in the same way. Now bend down the saddle easily so that it stays in place. Once this is a step backwards, take the 25 'lead line and let it move around the round pen, looking at the hips very close for a up and down movement while in the trot (this is where bucking can occur easily ). If there is no movement, then this is good! Stop it and change direction and move it again as before (remember 5 times around the round pen!). When this is easily achieved (after about 7 days), approach the horse on the left side (the side) and try to put your left boot in the stirrup. Make sure you have a helper to keep the horse for this. Do not let him go and do not bind him. You need someone on the ground to help you. If the horse resists, go back to the lunging. If you can successfully place your foot in the stirrup, gently add pressure with your foot until you leave the ground. Test the horse to see if there is a reaction, otherwise you will continue to stand up. Once you are high enough, simply and carefully place your right leg over the saddle and relax yourself. Find the right stirrup with your foot and place your foot in it. relax and take a good seat in the saddle. Use another person for earthwork for the next part! While sitting in the saddle, the person must go forward while holding the line and make sure the horse takes the first steps while you are on his back. This takes about 7-11 days to perform properly. After this we will assemble the horse without the help of someone else! Bring the horse to the center of the round pen, stop it, praise it and rub it on the shoulder. Take the reins in one hand and place your foot in the stirrup, put the horse up and hold the reins wide of the horse, you want it to move rather slowly! Say "Turn right! ", Pull something on the right rein and relax left, when he does, praise him right away. If he has achieved this, say "Turn left!" And put pressure on the left rein and relax the right rein when he does this, praise him and continue. These cleaning and voice orders should be strengthened at least every other day, it will cost about 40 good saddles (this is riding without problems of the horse) and then you can say that the horse is "green". All horses are different, some take only a few hours, some can last longer than 2 months, it all depends on the horse and what has been experienced in the past of human intervention in their lives. Horses like to learn and are ready to play, they just have to be pointed in the right direction! Well there it is, I hope this helps. I do not think I have excluded anything! But that's how I've done it for many years and I've been hit very little! Be careful and always have a person watched for safety purposes and to help if needed!